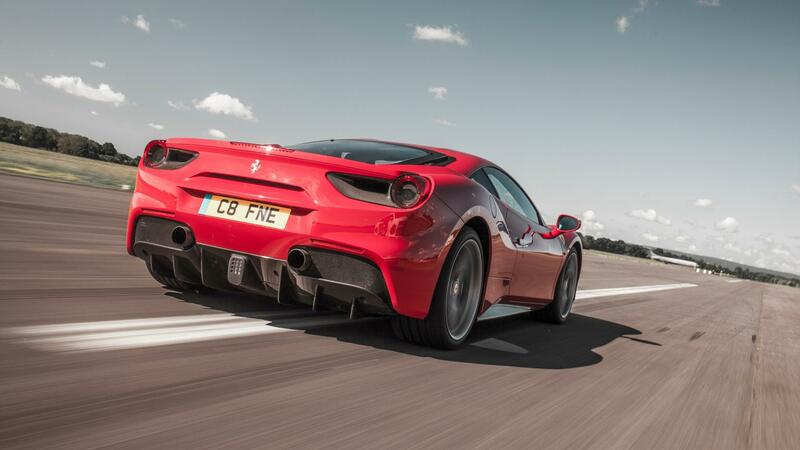 So, the turbocharged Ferrari 488 GTB. How is it? Well let’s start with the engine, since that’s the main point of contention. In place of the 458’s 4.5-litre naturally aspirated V8 that delivered 562bhp at a scalding 9,000rpm and 398lb ft at 6,000rpm, we now have a twin turbo 3.9-litre that delivers 661bhp at 8,000rpm and 560lb ft at 3,000rpm. So, more power, much more power in fact, but it comes with all the usual turbo concerns about noise, response and delivery. But Ferrari had to, didn’t they? We may love a naturally aspirated engine, but there was no way the V8 was going to deliver another 100bhp and trade blows with a McLaren 650S without a set of blowers being involved. It’s astounding. Ferrari is understandably cagey about what exactly it’s done to the make the turbochargers operate as they do, only going so far as to admit the twin IHI blowers rotate on ball bearing shafts to reduce friction and the compressors are made of a titanium-aluminium alloy. But the way it picks up and responds is nothing short of stunning. There is no appreciable lag at all, and nor does it feel artificially forced. The response is pure, linear, exhilarating and packs an enormous punch. It’s a bit like the hit of electric you get from the Porsche 918 Spyder (I know, get me), where the instant torque pick-up comes as such a surprise and delight that you find yourself slowing down again and again just to see what happens when you brush the throttle at 2,000rpm. So that’s what I do as I drive down the M4, ease on and off the power, unable to believe how instant the pick-up is, listening to the soft hiss of the turbos insta-spooling. Any inkling how it’s been done? I suspect Ferrari uses the inlet and exhaust cylinder ports to keep air passing through the engine when you’re off the power, keeping the turbos spinning. The BMW M3 has this pseudo anti-lag feature in Sport Plus mode and it’s very effective. The reason for not doing it is that it harms fuel cycle economy. In real life however, that’s not an issue as you almost always want to be in the turbo zone. But if the 488 has a drawback it’s that it’s not great on fuel – they claim 24.8mpg (11.4L/100km), we got 17.7mpg (16L/100km). But you don’t care about the £100 fill-ups because if you can afford to splurge £183,964 (or £241,756 if you like to drip with as much carbon as our test car) on a Ferrari, a 483km touring range is fine. So no lag. What about noise and delivery? 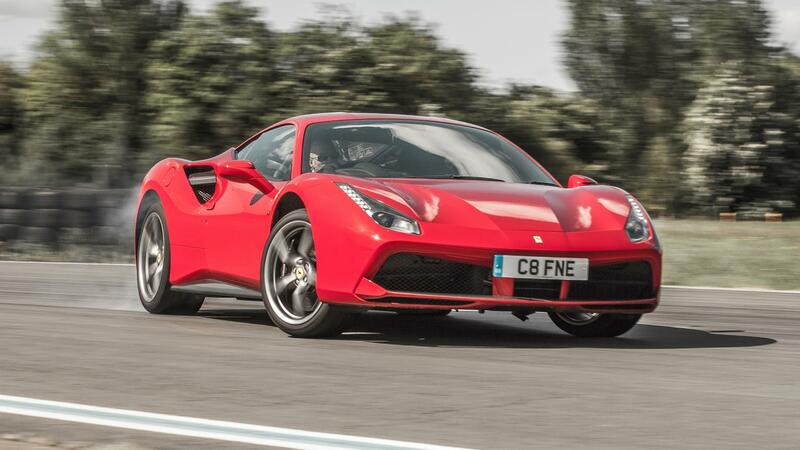 The way the 488 kicks through the rev range is nothing short of epic. It’s massively fast of course, forcing you back into the seat with its rampant torque and ability to not just sustain that pressure but actually increase it as the revs rise. There is a sense of crescendo to this turbo engine, the only downside of which is that the 8,000rpm limiter seems to arrive too soon. This is chiefly because the engine doesn’t appear to be working that hard – turbo engines rarely do as the blowers tend to smother, or at least dull, the natural characteristics of the engine. The Ferrari is no different in this regard – it piles on speed so effortlessly that you’re almost always travelling much faster than you thought you were, the sense of speed (0-100kmh in 3.0secs, 200kmh in 8.3secs, the quarter mile dealt with in 10.45secs) disguised because of the linear delivery and lack of top end yowl n’ howl. So it doesn’t sound good? I didn’t say that. For a turbo engine with a flat plane crank its very good, barking and snorting away as it rampages its way to that 8,000rpm cut-out. 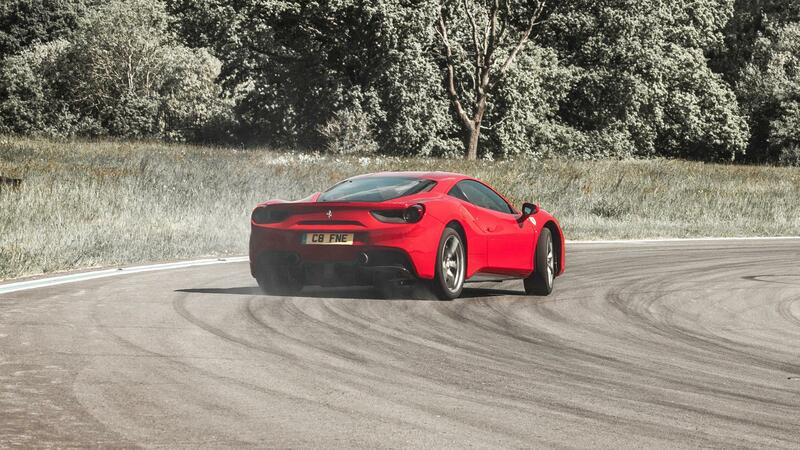 However, it’s lost the tingle and scream that made the 458 just so utterly addictive. That was a more organic experience – it seemed alive, to be actively fighting the physics. As an experience the 488 is that bit blunter. But make no mistake, still very, very impressive. And actually a much, much better car to drive regularly. Well, the 458 was quite highly strung. It fizzed with energy all the time, whether that was at 5am or on a motorway cruise, it didn’t know when to pipe down, had no off switch. Now for a lot of the time that was great – it sucked you into its orbit, made you want to be naughty and was so frenetic and excitable at the top end that it could barely contain itself. But it was also quite wearing. 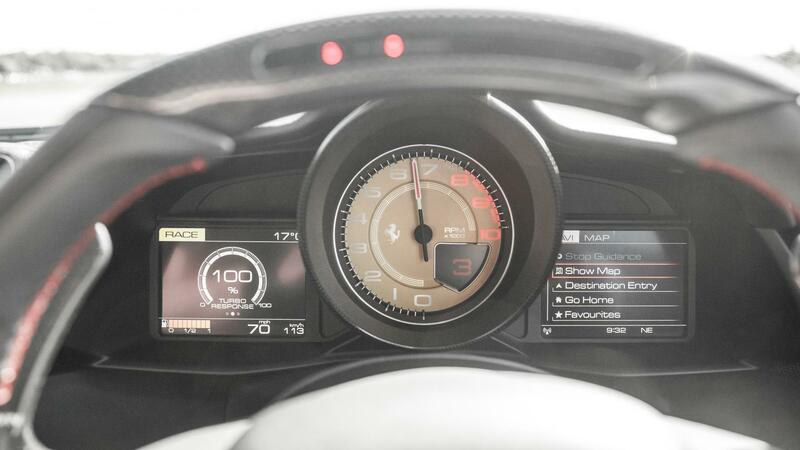 The 488 dials back the stridency to much more manageable levels. The noise is less penetrating at start-up, and the whole car feels less tense, so has the same effect on you. Well sort of. Certainly one that’s very well mannered, quiet enough at a cruise without being silent enough that you forget what you’re driving. Two things that often get overlooked with the latest Ferraris: how beautifully built they are and how easy to operate. Honestly, the material quality and the sense of solidity is astonishing and if you can see past the overly fussy steering wheel and binnacle pods, the actual physical operation of the car is blissfully simple. You pull the paddle, press the throttle, the handbrake self-releases and you’re away. The calibration of the throttle is superb, so it never lurches, visibility is good, every driver control is positive and precise. Even those pods either side of the wheel now operate more logically. And while the optional Goldrake carbon seats in this test car look aggressive, the leather pads are very comfortable to sit on. How do you find the interior design? It looks quite bare, doesn’t it, with no central console to divide the footwells? I’m not sure about that, but I also like the fact it doesn’t look or feel like anything else. There’s reasonable storage (plus the front boot is commendably, surprisingly spacious), but I’d understand if you preferred the more wraparound, enclosed surroundings of a Huracan or 650S. I’m glad you mentioned that, because it’s sublime, one of the car’s stand-out dynamic attributes. Of course it helps that the 488 has a very low centre of gravity as a starting point, but the magnetorheological dampers (press the button on the steering wheel for ‘bumpy road’ mode) do a wonderful job. I drove it softened off most of the time, enjoying not just the compliance in the chassis, but the hint of roll through corners which let me know the car was starting to work. And when it does work? Well, it can happily cope with all 661bhp. And because the car can, so can you. It is fantastically approachable and friendly no matter how hard you clog it. It always seems to have answers to whatever buffoonery you present it with. 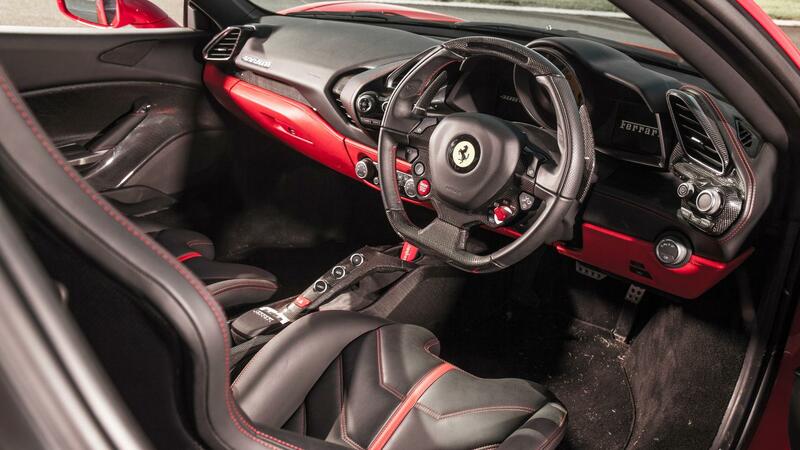 It makes you feel like a better driver than you actually are – the flattering Ferrari. So you whoosh around on the turbos, gusting from corner to corner, relishing the brakes, the turbo response, the 488’s energy and ability. This is all the more remarkable given how fast the steering rack is. Personally, I’d like it to be slightly less eager, to match the chassis’ composure. It makes the car feel slightly over-sharpened, and there’s not a vast amount of feedback. It gets better when you go faster and put more forces through the front suspension, but I don’t think it steers quite as cleanly and crisply as a McLaren 650S. Close run thing though and even with turbos the Ferrari does have the edge for charisma and engagement. And it’s just so damn driveable. This is what I couldn’t get over. It might not be as over-endowed with noise and drama as the 458, but there’s something about it that just compels you to keep driving. And not just on a great road. The way the 488 processes around town (good ground clearance) or down motorways is actually very beguiling. There’s always some dynamic attribute that glows brightly, or something to relish about the way it changes gear or rides or sounds or goes. No matter what you’re doing or where you’re going, it holds your attention.